Welcome to Friday Fiction Facts: sciency things that fiction writers need to know. Got some characters spending the night in the woods? Want to scare the hell out of them? For this special Halloween edition of Friday Fiction Facts, here are some real-life spooky things you can throw at your camping characters, all guaranteed to bring on trembling legs or a good scream. 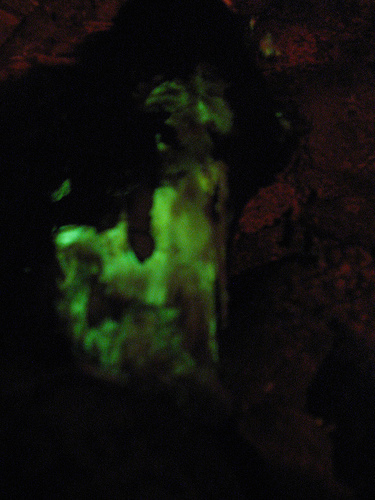 Now you might not think that glowing fungus would add much to a scene, but imagine this: a spooky dark forest where suddenly glowing green orbs hover 6 feet off the ground or a whispy white light seems to leak out from behind a tree’s bark. Woooo….. cue the spooky music. In an earlier post I talked about Foxfire, a common name for several glowing fungi. I also wrote about Armillaria, the glowing fungus in the above image. Read more about those HERE. In addition to glow-in-the-dark fungi, there is another thing that will quickly creep out your characters, and that’s eyes in the dark. 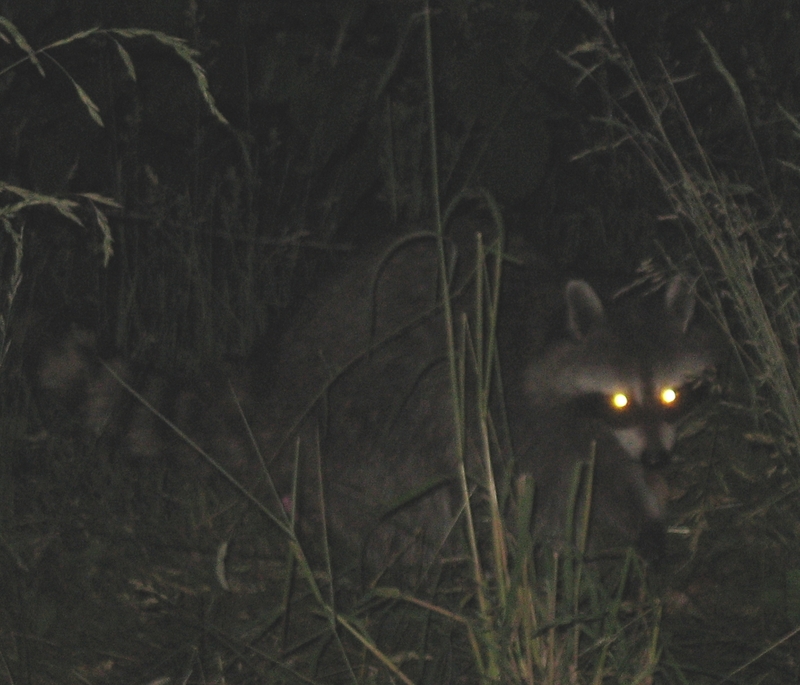 Nocturnal animals (especially) have, what is called, tapetum lucidum, a layer of tissue behind the retina that reflects light back into the eye and provides superior night vision. If you are looking for a real-life mystery to incorporate into your novel, one of these might just do the trick. And besides, don’t they have fabulous names? They do! Like Hum, Julia, Upsweep and Mispouffers. But there are some explained sounds that can be pretty spooky too. Sure everyone knows about howling wolves, screeching wildcats, yipping coyotes, and hooting hoot owls. All cliche in the world of fiction. So how about some new ones you might not know about. And do you know what these are? Answer is at the end of this post. And that creepy crunching crashing sound near your characters’ creekside tent? 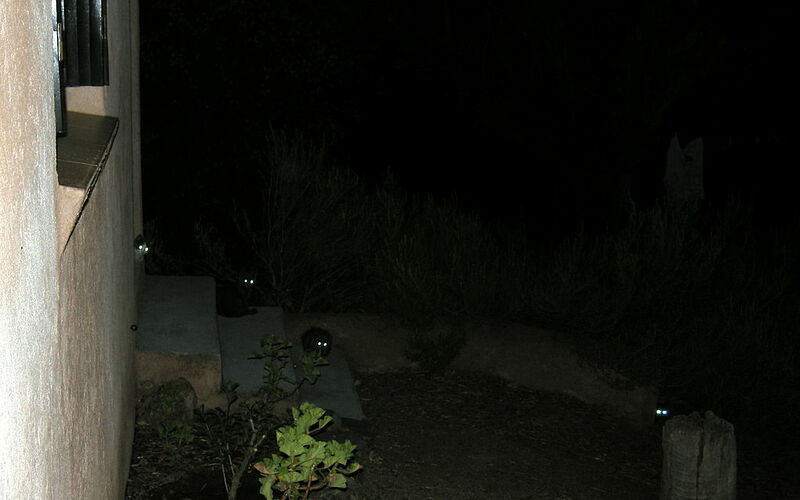 Finally, there are a whole menagerie of animals that walk, run, slither, climb and fly at night in the forest. Commonly known, and used frequently in fiction, are owls, bats, bears, wildcats and wolves. But there are some that are just a bit more creepy. 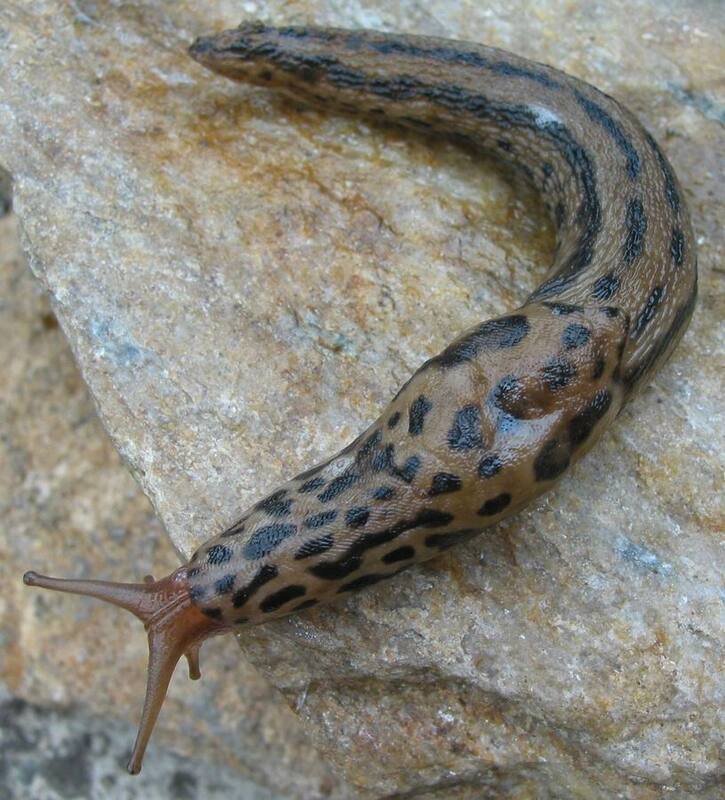 Like, how about having an 8″ Great Grey Slug slime across your main character’s face while she sleeps? And some are more startling than creepy. Sure, it’s unlikely a bat will fly near anyone, but what would happen if this giant nocturnal moth flapped into someone in the dark? Ghost! No! Don’t run away! It will follow the flashlight beam. Your poor terrified character just has to stand there in the pitch dark and wait for it to leave…if he dares.